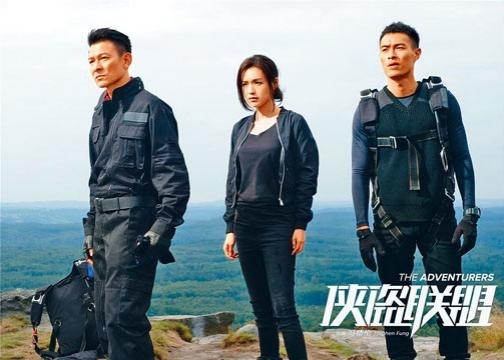 The Stephen Fung Tak Lun directed, Andy Lau Tak Wa, Shu Qi and Tony Yang starred action film THE ADVENTURERS (HUP DOH LUEN MUN) will open in the Mainland on August 11th. This "castle theft" poster featured a giant castle and the cast in camouflage. Falling off a horse earlier and still recovering at home, Wa Jai in the poster slid from above in full military gear. As for "Mrs. Fung" Shu Qi had a lollipop on a motorcycle and looked helpless; Tony Yang landed on top of the castle like a bird. Because "Fung Shu" wed secretly overseas during the production, this film already caused a stir before its release. Would Mr. and Mrs. Fung promote together?